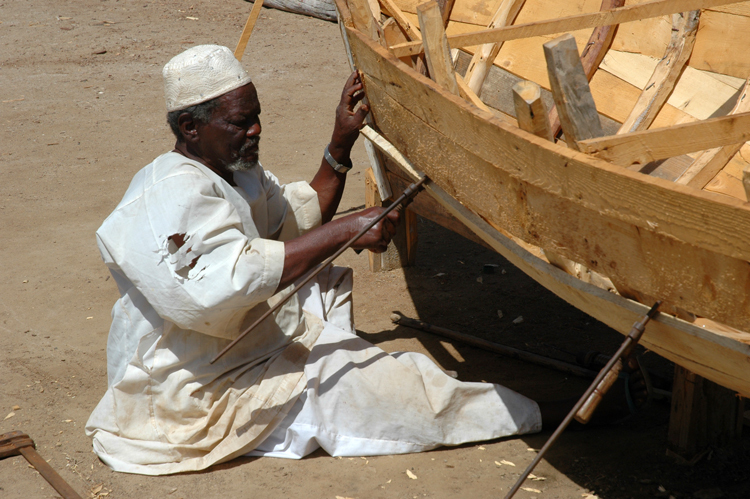 Traditional boat building is alive and well in Sudan. 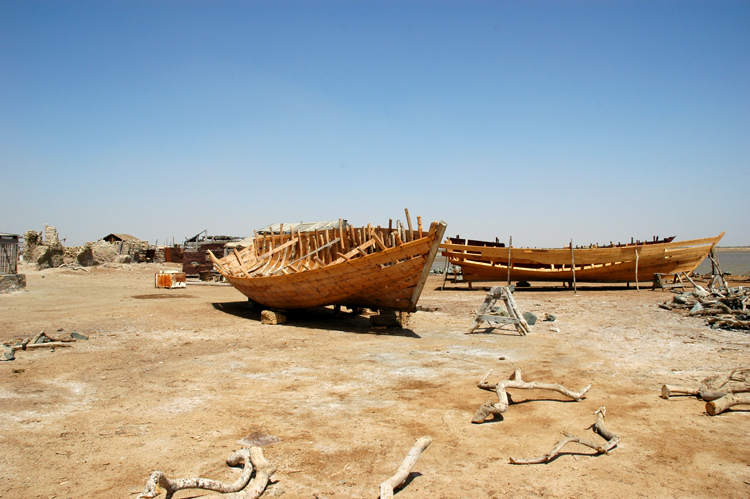 As we toured the waterfront in Suakin, we visited a boat yard where craftsmen build wooden fishing vessels. 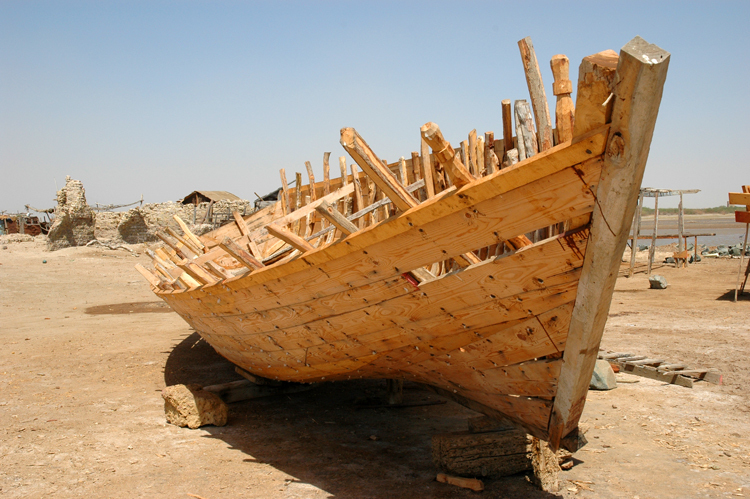 They used an adze to shape tree limbs to the curvature of the hull to create ribs for their boat. Next, they attach rough sawn planks to the vertical ribs. Notice the twisted tree limbs lying in the foreground. 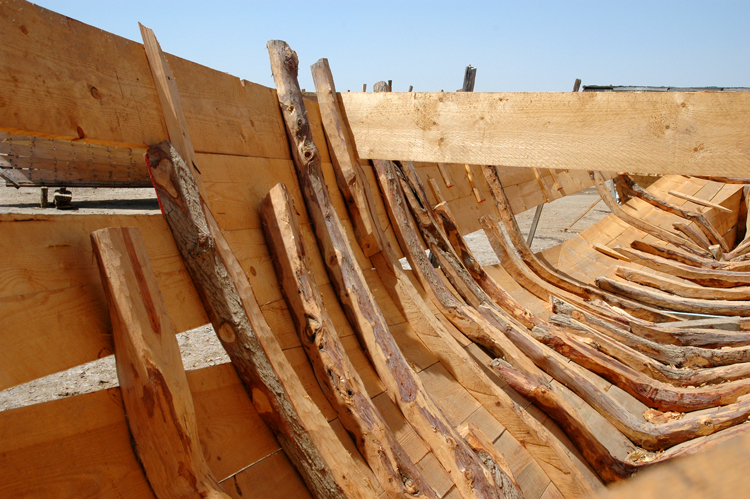 These tortured timbers would be stove kindling anywhere else in the world, but in Sudan, they will become the ribs for another ship. It's doesn't take many tools to make a fishing boat. An adze, four clamps, a drill, a screw driver and some screws are all you need to get the job done. A yacht, it is not, but for a fishing vessel, it's mighty fine. 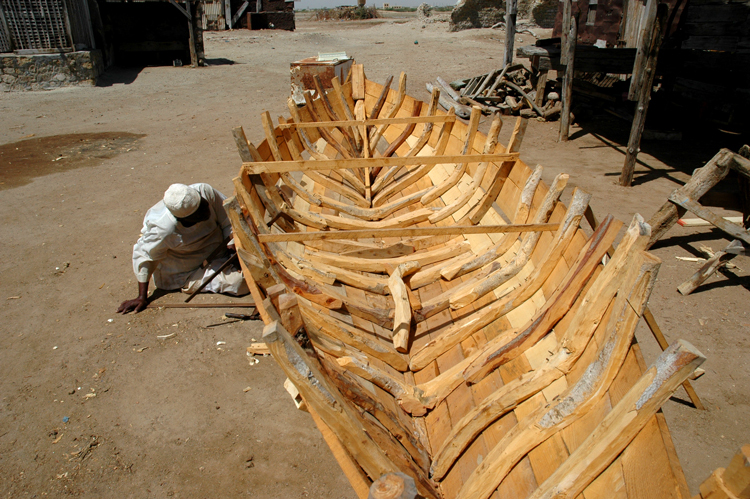 Sudan doesn't have many trees for lumber, so the shipwrights shape tree limbs into the ribs of their small sailing ships. They take the little that they have and turn it into something big. Every time I look at my own challenges and wish that my life was easier, I remember these hard working craftsmen. If they had my resources, they would be building super yachts. 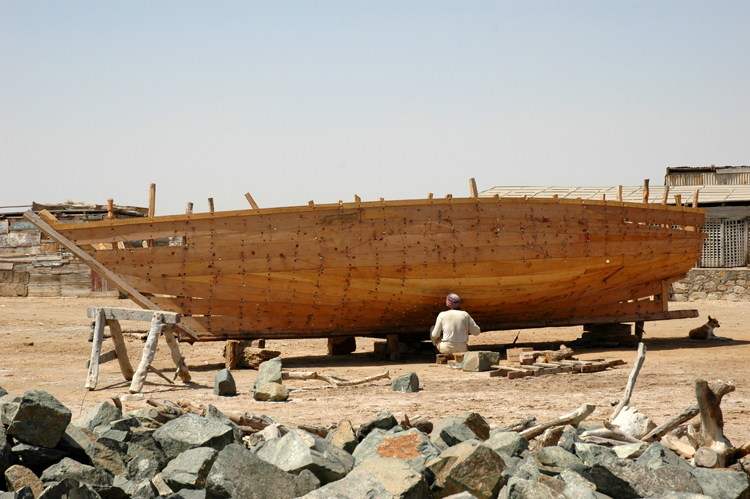 This small fishing boat has it's ribs in place, and except for the stern, most of the planks are in place. They don't have facilities to steam bend timber, so carpenters resort to pry bars and clamps to fix the planks in place. This brave shipwright faces the lonely task of drilling thousands of holes in the planks so that he can place the final fastenings on the hull of this large fishing vessel. You won't find any electric drills or power tools in this shipyard. 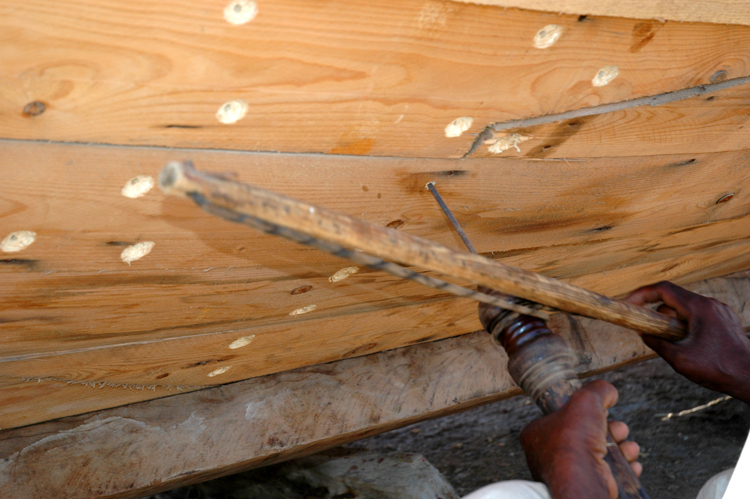 This craftsman uses people power to drill the holes for the fastenings in this boat. Here's more people power at work. 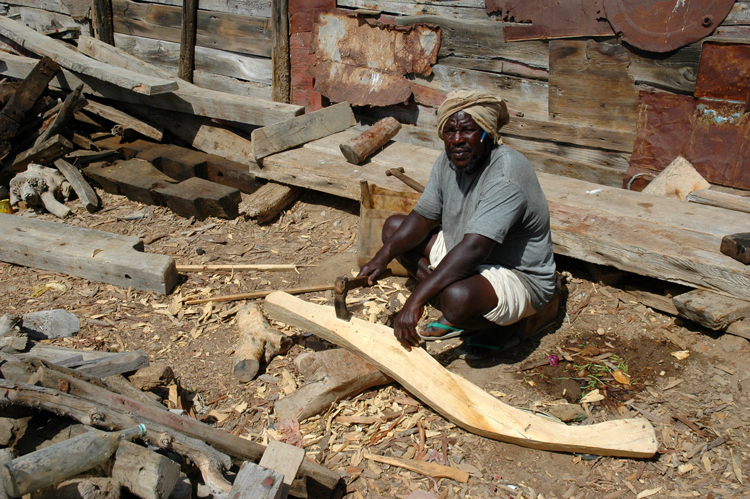 An old fashioned adze shapes timber for a new boat that will soon be sailing on the Red Sea. When I see what these people accomplish with hand tools, dry timber, and a few tree limbs, I am humbled. 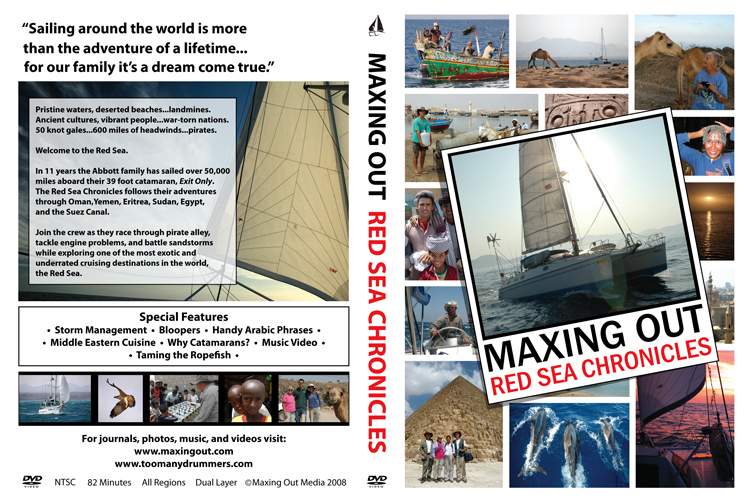 With only a few resources, they create great things. One of my favorite sayings is, "To whom much is given, much shall be required." I have had so many blessings and have been given so much, and when I look at what I have accomplished so far, I feel like I don't measure up to people like these who live with grace and overcome adversity every day. People who do the best they can with what they've got, no matter where they are, will always be my heroes.